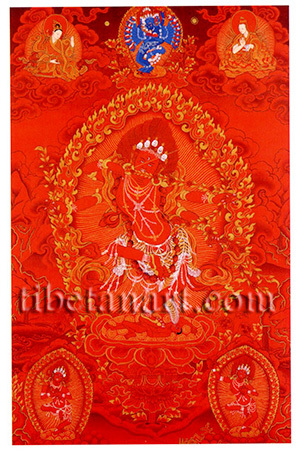 This gold-on-vermilion thangka depicts the Dakini trinity known as the ‘Three Minor Red Ones’, which are listed in the ‘Thirteen Golden Dharmas’ practiced in the Tibetan Sakya School tradition. These three subjugating goddesses are Kurukulla, Vasudhara, and Tinu, who are all youthful, lusty, semi-wrathful, and red in colour. The practice of Kurukulla is found in all schools of Tibetan Buddhism, but within the Sakya tradition she is associated with the Hevajra Tantra, and the sixteen-armed, blue-black and skull-bearing form of Hevajra appears above her in this composition. Kurukulla is slightly fierce and ruby-red in colour, with three eyes and four arms. She is radiant and youthful like a sixteen-year-old, and disports herself sensuously, with two full and firm breasts and a beautiful face that combines the sentiments of mirth, passion and wrath. Her three eyes are piercing, she bares her sharp teeth and fangs, and her tawny hair streams upwards. She stands in ardha-paryanka or dancing ‘bow-and-arrow’ posture with her right leg drawn up and her bent left leg pressing upon the breast of a male figure that lies prone upon the golden sun disc of her lotus throne. She is adorned with both gold and bone ornaments, a five-skull crown, a long billowing silk scarf, a garland of fifty freshly severed heads, and a loosened tiger-skin loincloth that reveals her pubic area. With her first two hands she draws back the string of bow made from red utpala lotus flowers, with her right hand at the level of her ear and her left hand extended. With her second right hand she holds a hook that ‘subjugates the three-worlds’, which is also fashioned from red utpala lotuses; and with her second left hand she holds a noose of red utpala flowers. She abides within a radiant aura and a blazing circle of awareness fire. In the lower left corner is Red Vasudhara (Tib. Nor-gyun-ma mar-mo), the ‘Stream of Wealth’, who similarly abides within a radiant awareness aura and stands in bow-and arrow posture upon a golden sun disc and lotus. She is slightly fierce, with two arms, three eyes, bared teeth, and upward streaming hair. She wears a five-skull crown and her naked body is adorned with the five bone ornaments. With her left hand she holds a white skull-cup full of blood, and with her right hand she holds the stem of a jewel ear of grain. In the lower right corner is the red Goddess Tinu (Tib. Lha-mo ti-nu), who is similar in form to Vajravarahi and likewise stands in bow-and arrow posture on a sun disc and lotus adorned only with a five-skull crown and the five bone ornaments. With her left hand she holds a skull-cup of blood in front of her heart, and with her right hand she holds aloft a vajra-handled curved knife. In the upper left corner is King Indrabhuti of Uddiyana, and in the upper right corner is a lineage lama of the Tibetan Sakya tradition.